Ordinary Goodness: What I loved in October. What I loved in October. It's already time to do this? WHOA. Love, support, connection. It's been a treat to receive so many good wishes on our engagement. From calls and texts to Facebook posts and e-mails, and of course in-person congratulations, we have been truly humbled by all of the excitement on our behalf. Hearing from friends and family across the country has been awesome! Speaking of weddings... I attended my last two of 2013 this month (unless someone springs one before New Year's), both exceptionally fun parties. My dear friend that I've grown up with - my first friend-from-childhood wedding - had a lovely outdoor ceremony at Vecoma at the Yellow River. Not gonna lie, I cried when she walked down the aisle to "The Way You Look Tonight." Weren't we just 8? Got to reunite with lots of youth group friends, and I love a good dancing reception. And they had a pumpkin wedding cake! 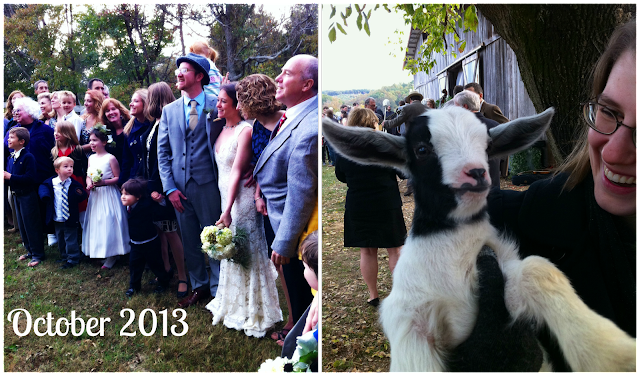 This past weekend, I went to my cousin's wedding at The Barn At High Point Farms outside Chattanooga. It was a true family reunion, so special to visit with faraway cousins. She got married overlooking a field chock full of cows, horses and goats, with two especially interested bovines standing only feet away (separated by a fence) - the kids loved that. It was a wonderful ceremony, with such eloquence throughout the night: a moving homily by the minister, and memorable toasts at the reception. And we got to hold baby goats! Can it get better? Bread & Wine by Shauna Niequist. Goodness, what a great book. My friend heading west brought it to me, and I absolutely adore it. Shauna writes about everyday life in that simple, spiritual way that I hope to emulate, AND her descriptions of food and cooking are absolutely sumptuous. AND she includes recipes. I still have a couple of chapters to go because I've been savoring the whole thing. Spooky Spin. Full disclaimer, I am the least creative costume-y person of all time. But my spin class friends are incredibly imaginative and inspired when we get around to our Spooky Spin ride the week before Halloween. Witches, vampires, Cleopatra, Batman... Yes, all while pedaling hard to spooky classics like "Thriller" and "Werewolf in London" (Ah-OOOOO! we all sing along...). Our instructor won the day with her (creaky voice) "Ell-i-ott" hoodie and a basket on her bike containing a styrofoam, spray painted E.T. School of the Spirit. Our third retreat as part of this year-long spiritual formation class took place earlier this week, and again, it was enriching and gratifying. Fellowship, reflection, learning, good food... We talked about our ruts, where we get stuck, unhelpful patterns we fall into, and how to counteract those with prayer, journaling, talking about it, simply recognizing those moments.... So relevant to my life! Blogging. I've been more prolific here lately, and it's been a lot of fun. We'll see how the inspiration manifests itself heading into November (and basketball season)... Stay tuned! Basketball luncheon. On that note, today I attended the annual preseason lunch for Davidson men's basketball. It was fun to see familiar faces, meet new folks, and hear Coach McKillop speak as he prepares to begin his 25th year as our head coach. It's a great reminder of what ties us together as a community, perhaps starting in an arena but spanning far beyond it. The season starts next week. As always: Let's go 'Cats! And you, friend? Your favorite October moments?